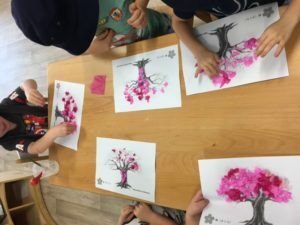 Over the past few months, the Japanese educators at Kool Kids have been busy planning a range of activities for the children at our centres! Read below to find out what we got up to. It was exciting to teach the junior kindy children numbers up to five, and the senior kindy children up to ten. To memorise these words, we used hand gestures. If you’re wondering how, you can learn it too using the gestures below! To further strengthen our memory of these words, we played hopscotch, bowling, chop sticks and a variety of other number games. One day, we asked the children to tell us their age in Japanese, “nansai desuka?”. Most of them responded in English, but are slowly learning how to answer in Japanese. for example, saying “San sai desu” which means three years old. 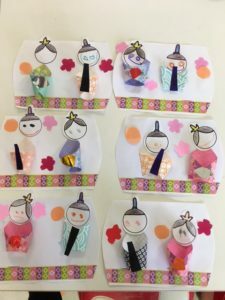 The 3rd of March marked the beginning of Hina- Matsuri, the doll’s festival for girls. This festival is celebrated to pray for the health and wellbeing of girls in the family. It’s also called peach festival because this is the time of peach blossoms. Sweet milk sake and diamond cakes are usually consumed at the time of the event. 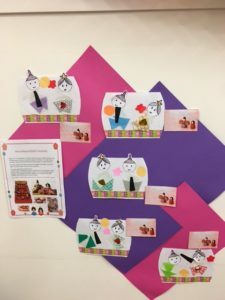 Here at Kool kids, the children created their own emperors and empresses with origami. With great skill, they drew faces and stuck the paper together to resemble dolls! Recently, we haven’t been only learning to say numbers in Japanese, but colours too! Just like as we would in English, we focused on learning the primary colours in Japanese first, before moving onto secondary ones. Red is “Aka”, blue is “Ao”, yellow is “Kiiro” and green is “Midori”. Once we thoroughly learnt the primary colours, it was time to move on to learning the secondary ones. Pink is “Pinku”, orange is “Orenji” and purple is “Murasaki”. We then sang the rainbow song, remembering as many colours as we knew how to say in Japanese! 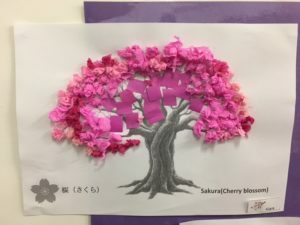 Spiring is one of the most wonderful times of the year in Japan due to the blooming of cherry blossom trees. The Ohanami festival is a special time where people gather to eat and drink under the fully bloomed cherry blossom. These trees only last for a short period of time, from late March to the beginning of April. The Sakura (cherry blossom) reminds us of how life, although short and fragile is still so beautiful. 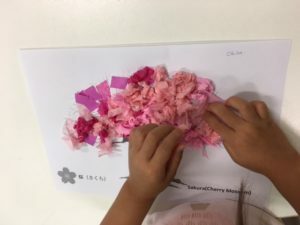 To celebrate the Ohanami festival in our own little way, the children made cherry blossom art. 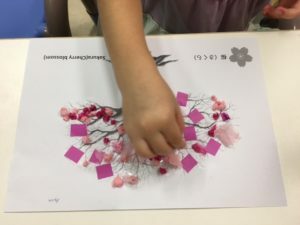 With lots of concentration, they ripped a paper into tiny pieces, crumpled them into little balls and stuck them onto branches of cherry blossom paper. 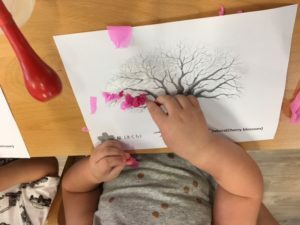 We were so proud of their unique creations!